I'm just going to start off by saying that this really isn't a self portrait. First, it wasn't taken with the intent of being used for this month's photo. Second, I didn't take it. It is a random cell phone shot that I asked my hubby to take for me because I wanted to post it on Instagram, and the fact that I am resorting to using it for my November self-portrait speaks more about what my month has been like than any other staged photo could. November has been an insane whirlwind of getting ready for the portraits that Kevin and I had taken earlier in the month, combined with a very busy shooting and editing schedule as the photography season in Arizona kicks off. So, I have spent the majority of my time either behind my camera or sitting in this exact spot editing images (as I am doing in this photo). 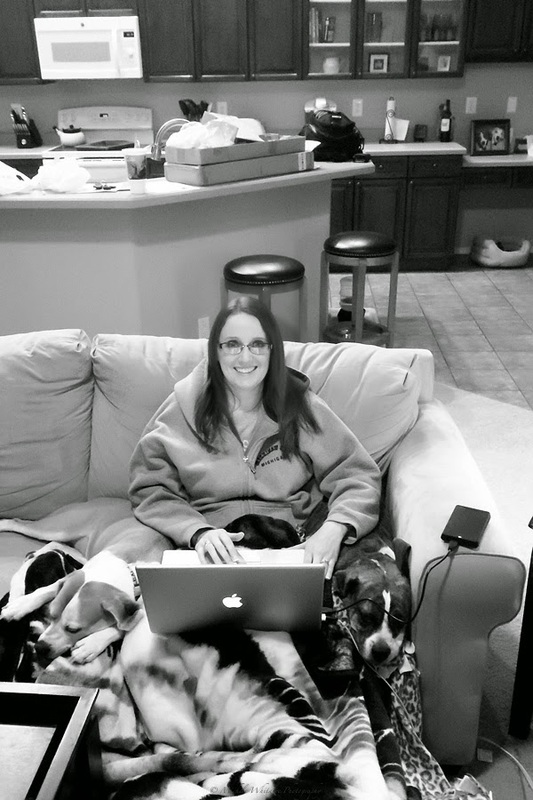 Also, as in this image, I'm usually accompanied by the dogs as my awkward but adorable arm rests (and covered in layers and buried in blankets because our weather took a very abrupt downward turn into colder temps and I've been freezing). Also of note in this photo are the piles of stuff on the kitchen island behind me, which again speak volumes about what my life is like right now. Anyone who knows me in IRL knows that having stuff littering the surfaces of my house is highly unusual and only tends to happen when I'm crazy busy, but it is a good crazy busy as most of it is because my photography business is booming! So, here's to wrapping up an insane but good November, and with it my 2014 shooting season!